With the paranoia of an impending Double-Dip Recession seemingly forever looming over us, what better than to help your clients get their bills paid? With competition in Finance and Accounting Business Process Outsourcing (F&A BPO) reaching cut-throat levels (just observe some recent down-select negotiations and you'll know what I'm talking about), what better than to acquire one of the most attractive onshore order-to-cash (OTC) specialists? With demand for comprehensive F&A BPO coming from both mid-sized, in addition to enterprise-level clients, what better than to acquire an OTC specialist with on-the-ground delivery expertise and a mid-market offering? 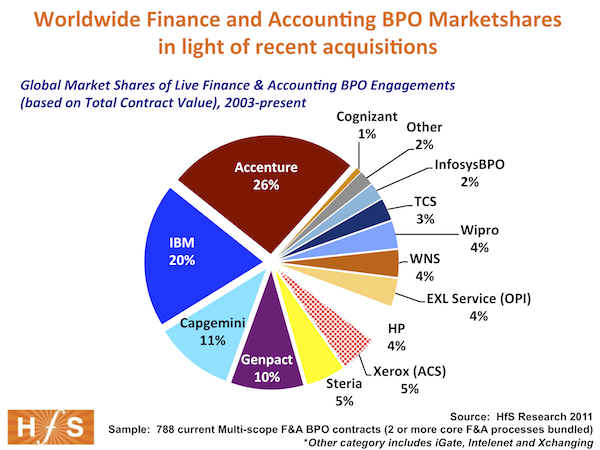 Yes, Capgemini has made a major move towards strengthening its position in the global F&A BPO market by today acquiring VWA - and leaping to third in the market share spot for F&A globally (which may change when we re-cast our data early next year, but for now they're on podium). You can also read more about our 2011 F&A BPO market landscape and outlook by clicking here. VWA brings to the table a quality order-to-cash business platform called "WebCollect". We believe WebCollect can really help both new and existing clients standardize on quality standard workflows, which our research is abundantly demonstrating is where much of the future of BPO is headed. VWA's business takes Capgemini into the middle-market. With saturation occuring at the high-end of the market, attention is turning to the middle-market (the $500m-$3 billion segment), where clients are frequently seeking "bigger-bang" and more comprehensive deals that the top tier providers can comfortably cater. Our recent State of Outsourcing industry study shows the increasing relevance of the middle-market to BPO services areas such as F&A. This year, Capgemini has BPO as a top-tier service line which will help it capitalize on the acquisition. Rather than submerging BPO as a secondary service line under ITO, which some other service providers persist in doing, Capgemini's BPO division now enjoys status as a major front-line services category in its own right. While this brings increased financial scrutiny from the board, it also empowers the division to get access to similar sales, marketing and development funds as those enjoyed by other top-line services divisions, such as consulting and IT services. This added marketing muscle will be critical for branding the VWA capabilities, as they are fully merged into the broader BPO division. Capgemini's brand in the US. With all roads traditionally leading to Paris, this has been somewhat of a perennial weakness for Capgemini, when competing for US-centric BPO deals. However, major client wins in recent years, such as Coca Cola Enterprises and Avon Products have done a lot to increase awareness and exposure in the US market. Capgemini needs to leverage VWA carefully to improve further the awareness of its significant onshore US presence and brand awareness as an F&A BPO provider. Too much focus on horizontals versus verticals. With Capgemini's increasing strengths in F&A, procurement, supply chain and customer management BPO, the firm does run the risk of losing focus in some of the emerging vertical BPO markets, for example banking, insurance, life sciences, healthcare and energy. Capgemini needs to figure out how to develop and position its vertical strengths effectively and not become overly submerged in a horizontal play. Potential conflicts with existing engagements. VWA is present as primary OTC "subcontractor" on engagements where Capgemini's competitors are the primary F&A BPO supplier. This could create some contentious issues with regarding to working relationships and contract renewals. However, it could also put Capgemini in the unique position of potentially edging out some of its primary BPO competitors, so this could ultimately provide more opportunities than headaches. VWA fills many of the needs Capgemini has as an emerging F&A BPO powerhouse. There aren't too many BPO acquisitions that appear to be as solid a fit as VWA into Capgemini, and the market for AR BPO is critical for future growth in this space. The next challenge for all BPOs is going to be creating more utility in the market to take on more clients, and the WebCollect platform has great potential to provide a platform this growth. HfS would like to see Capgemini embrace WebCollect and develop it over time to cater for clients with specific vertical requirements, for example in the retail space versus hi-tech and media. Do you expect more acquisitions like this in F&A, as a reaction this? I'd be surprised if we see anything immediate. Most of the BPOs are looking to acquire vertical platforms and industry capabilities, as opposed to horizontal capabilities. I believe we'll see them looking to invest in large clients engagements that give them added scale, platform and process flow than make outright acquisitions of other providers (such as the recent TCS/Friends Life deal). Why? because it's far, far cheaper to "buy" client deals at low margin, that pay the multiples on expensive providers, which may not bring much to the table beyond a lot more location and people scale.